What Trumpet Mouthpiece Is Best For High Notes ? If you are wondering what trumpet mouthpiece to use for high notes you are on the right page because in this article I will give you a few suggestions on what I consider to be the best mouthpieces for high notes. It’s important to realize, however, that these so called “high note mouthpieces” should not be used as your main, all around, mouthpiece IF you also are playing music where a warmer, softer sound is required…. …such as, for example, hymns in church, warm smooth jazz ballades or when you play classical music in a orchestra and mostly play in the middle and low register. But the term “all-around” is tailored to the individual and you perhaps mainly play in settings where the trumpet sound needs to be a bit louder and brighter and if that’s the case then, sure, the “high note mouthpieces” could be used as your “all-around” piece. Personally I have used it for playing high descant parts for hymns and I have also used the 3E for soprano cornet in brass band. (There are 3E sizes for both trumpet and cornet) I like the feeling of the rim. It does not “bite” my lips. Sound is pretty bright but not so bright that i could not use it in almost every playing situations. The cup is shallow but it is still able to produce a decent sound in the middle register as well. This makes the mouthpiece versatile and useful in different kinds of musical settings, and not just for high notes. It adds about one more note to my usable high note range. …that’s not a bad thing though and it might be just what you are looking fore since you are able to get the best of both worlds with this mouthpiece (that is, more legit playing and high note playing). It is also a bit cheaper (click here to check the price) than most trumpet mouthpieces for high notes, so if you are short on cash then this could be the first one to try. Also, as I said, it’s not too extreme so if you are new to high note mouthpieces then it could perhaps be a good start, before you try out any of the other ones. …however as soon as I started to back off with the air a bit the tone really opened up and the mouthpiece just started to sizzle and it felt great! This mouthpiece makes articulation above the staff incredible easy and the high notes have a nice “sizzle/energy” to the sound. The intonation is also excellent, both in the low, middle and high register. This is one of the most popular high note mouthpieces for trumpet, and for good reasons, as most players will be able to add a couple of notes to their high register, using the Shilke 14A4a. The main reason why I do not use this mouthpiece as my go to high note piece is because I don’t feel really 100% comfortable with how this Shilke rim feels on my chops. The last mouthpiece, further down on this list, is my all time favorite but you might have a different opinion, of course. Very good articulation which gives me much greater endurance. The high notes speaks easily and they have a nice “sizzle / energy” to them. Would I recommend this mouthpiece to you? …however, if you consider yourself to be a normally efficient player, then the Shilke could really serve you well. You can click here to check the current price on Amazon for this high note mouthpiece. The Yamaha Shew Lead is right now my absolute all-time favorite high note trumpet mouthpiece! Where can I use the Yamaha mouthpiece? …and thus my lips won’t swell as fast as they do on other mouthpieces. This makes me have much better endurance and I’m not getting tired as quickly. Adds about 2-3 notes to my usable high range! The low register also sounds good! Unlike many other high note mouthpieces the low register is also enjoyable to play on this piece. Robust, powerful and a massive “core” to the sound. …also, while you are there, check out the other real user reviews on the Amazon page. The mouthpiece is got some great testimonials! So is this mouthpiece for you? Hard to say. The only way to know is to try it out and if you order it from Amazon, you have one month to return it 100% free of charge, and get a full refund. I have a lot of high note mouthpieces on my shelf and the Yamaha is very often my “go to” high note mouthpiece. Who knows, maybe it will become one of your favorites too. …so if I had a gun to my head and could only recommend one single high note mouthpiece well then the Yamha Shew Lead mouthpiece, would be it. Also Note: I’m the kind of trumpeter that constantly likes to try new mouthpieces, so that means that the mouthpieces on this list may change over time, due to me discovering new things. There are many new brands coming out today that offers mouthpieces with prices that are very low compared to the conventional brands. I would stay away from such brands as the quality of these mouthpieces are far from what we want and the same goes with consistency. Ordering one of those is like playing Russian roulette, you could get a half bad high note mouthpiece, at best, or a totally worthless one, at worse. How does cup size, backbore, cup deapth and throat size of the mouthpiece affect the playing? This is the back end of your mouthpiece and what goes into the mouthpiece receiver on the trumpet. The amount of flare of the backbore will affect the projection and how well the sound carries. In general one can say that a tighter backbore makes playing loudly more difficult, due to the increased resistance and, on the other hand, soft playing is genearally a bit easier with a tight backbore. Some people expereince a bigger sound with a bigger backbore but it’s mainly the carrying power and the projection that is affected. We can also call this the “bite” of the rim. Note that there can be different sharpness/bite to the inner vs outer rim. The roundness is not directly that important for the quality of the sound but, since it plays a big part in how comfortable the mouthpiece feels on the lips, it still affects the over all playing and thus, indirectly, also affects the sound. If the roundness of the rim feels just right for the player, he will also be able to articulate better and better articulation will almost always result in a better sound. This is something that is very personal and every player has to find his own “favorite” rim surface. There is a general conception that the smaller the size of the rim, the easier the upper register will be. For most people, this is not the case. Going too small will actually decrease your range but so does going too big. If the least a bit unsure on what is the optimal size for you then always start in the “middle” and slowly experiment in both directions from there. Statistically this will shorten your “experimentation period”. ..if you go too shallow you will not get that benefit. Trumpet high note mouthpieces are generally more shallow than standard mouthpieces, as they should because of the desire to “cut through” the ensamble with a bright and sizzling tone. 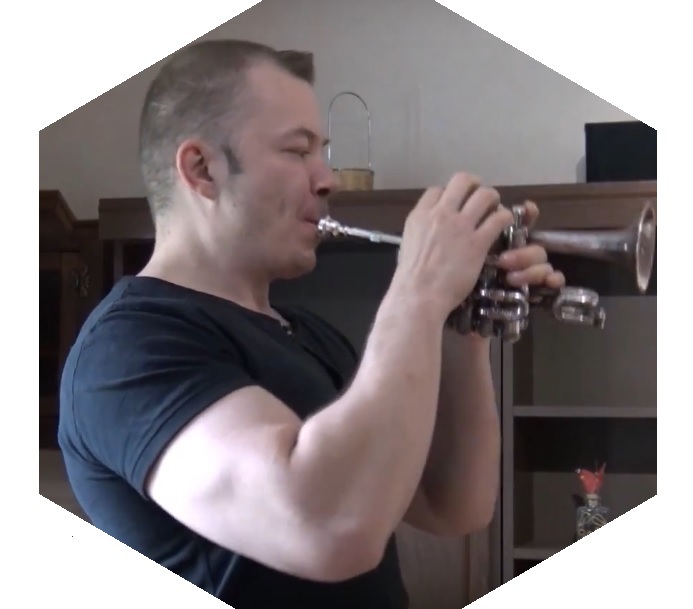 On the other hand a soft cornet solo or flugerhorn solo is almost always played with a mouthpiece that has a deeper cup. Bigger sizes are also found and some people like those very much. However, if the throat size is too big for the player, or for the mouthpiece, then the upper register tends to become too sharp, the endurance will suffer and, for some, playing softly will be very difficult. Playing with a small throat size will for many people make the upper register “choke” and block off. In general we can, again, state that the “middle ground” tend to be best to, at least start from and then slowly experiment in both directions from there. P.S. While we are on the subject of trumpet mouthpieces, perhaps you would be interested in reading the article Plastic Vs. Metal mouthpieces – What’s the deal?